The Palmyra New York Temple is the 77th operating temple of The Church of Jesus Christ of Latter-day Saints. The site for the Palmyra New York Temple, atop a wooded hill in pastoral western New York, holds a special place in the hearts of members of the Mormon Church. To the west, in a grove of trees, is where founder and first prophet Joseph Smith had a vision in which he saw God the Father and Jesus Christ. The Palmyra, New York area is seeped in Church history. The temple sits on ground owned by the Church adjacent to the Sacred Grove and is also on the grounds where the Smith log cabin stood. It was in that little home that Joseph Smith received visitations from the angel Moroni. Near the temple site is the Hill Cumorah where the gold plates were buried, which Joseph Smith later translated to the Book of Mormon. About thirty miles away is the Peter Whitmer Farm where the Church was first organized in 1830. Local reaction to the new temple was positive and more than 30,700 visitors toured the new temple before its dedication. The temple serves about 18,000 members within seven stakes. 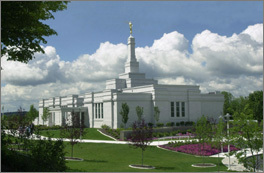 The Palmyra New York Temple was dedicated on 6 April 2000, the 170th anniversary of the organization of the Church. While only about 1,200 members attended the dedicatory sessions within the temple itself nearly 1.5 million members took part through media broadcasts throughout the United States and Canada. The Palmyra New York Temple has a total of 10,700 square feet, two ordinance rooms, and two sealing rooms. The exterior is white marble. Forty art glass windows inside the temple depict Joseph Smith's First Vision and the surrounding Sacred Grove. A gold statue of the angel Moroni tops the single spire. Beautiful carved cherry wood railings, wainscoting, and moldings line the halls, along with hand-sculpted carpeting. This page was last edited on 17 September 2010, at 01:55.